Hi My name is John Kelly I worked at Rotherham Mines Rescue Station till its closure then moved and manned a “B” scheme with my old colleague Tom Charlton at Denby Grange Colliery till the pit closed finishing my mining career at Maltby Colliery as a Colliery Deputy till I retired in 2010. I have found your site very nostalgic as I trained and used Proto Aerolox and latterly Sabre Safety, I worked with some true gents including the following as mentioned Tom, Ian Scattergood, Ralph Spooner, Geoff Wordsworth, Alex Laird, John Egbury, John Griffiths, Graham Wilson, Vince Balmer, Alan Eastwood plus many others through the happy times I had there. Hi - I live in Australia now but I’m from Nottingham. 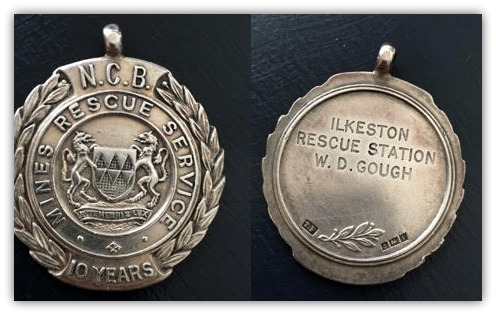 My grandad, William Denis Gough was awarded a medal for bravery - apparently he was photographed by the Post carrying out the last survivor from a mining fire - not sure where it was - is there any way to track this down? Is there a record anywhere? Please could you tell me, is there a database listing men who were part of Allerton Bywater Mines Rescue? I am a member of the Pinxton and South Normanton local history society and would like to ask permission to copy out your colliery shaft sinking details of numbers 1, 2, 3, 6 & Brookhill colliery to put into our John King memorial workshop museum on Victoria Road Pinxton, which we are now extending it will be an added interest to the local people and school-children, the museum is worth a visit there is no entrance fee but a voluntary small donation for up-keep it is especially an interest to me as I started work at Brookhill in 1945 at the age of 14 and was one of the onsetters there.